Posted on October 2, 2017 by pokeninja90Posted in Announcement, Personal, UncategorizedTagged adulting, blog, blog updates, Blogging, crochet, writing. Please please do a crochet series. For some reason I keep coming across them lately and now realize that it’s what’s een missing my whole life. Dude, I feel you. I totally feel. And yes, the last thing you should do is watch/play something JUST to write a review. It’s truly hell itself then 😂. That two year marker was the big one for me as well. Now I post when I feel like it (which still isn’t often tbh) but it’s not like blogging is the only thing I like to do, or that it’s supporting me financially in any way. It’s for fun, that’s why I started, and fun things come and go. Yes, the real world does take a lot of time sometimes. Hopefully you have the time and feel like writing again in the future and I look forward to whatever you decide to cover then. We all feel the same. I don’t know if it’ll also apply to you but you will surely some back no matter what. You just need some rest or somehing. Don’t rush yourself too much. Fighting! Mmm don’t push yourself and just do what’s natural. Glad to see you’ll still be writing. A blog post series about crochet would be great! We’re still all looking forward to your comeback, so take it easy! Hope you adjust to your new schedule soon. Oh yes yes, that crochet series sounds like fun! Is that series any good? 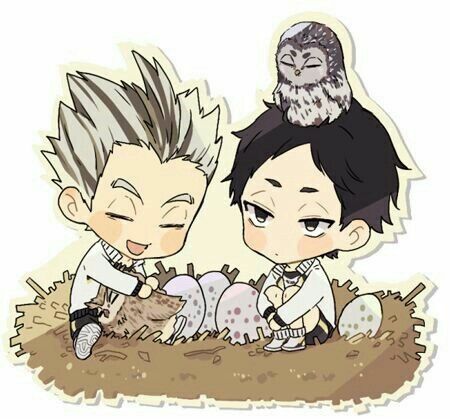 P.S- Here’s a kawaii haikyuu for fun! P.S. Have you seen Code:Realize? I’m guessing you already know everything about it, but my wife and I are enjoying this new otome this season, so I wanted to know what you thought. Awesome that you’re writing about BBB! I still have to watch the first one!